Taking on the Premier League champions in the next round of the FA Cup will galvanise Milton Keynes once more, says Karl Robinson. Dons booked a historic fourth round tie against Chelsea next weekend after dishing out a 3-0 win to Northampton at stadium:mk on Tuesday night, thanks to second half goals from Ben Reeves, Josh Murphy and Simon Church. 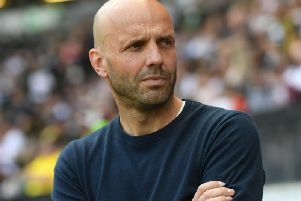 After a dramatic campaign last season, winning promotion and beating Manchester United in the League Cup, Dons are no strangers to holding big occasions at stadium:mk, and Robinson hopes the visit of the champions will once more get the people of Milton Keynes behind his side for the remainder of the campaign. “What the game does is galvanise the city. We’re the minnows in our league, but this drives people through the gate. If we get beat, we get beat. We’ll have a right good go. The magic of the FA Cup has once again shone on a Football League club. “I grew up in a city where football was a driving force, and I want to bring that to Milton Keynes. It’s a lovely place to bring up a family, but at some stage we want football to be a driving force in the community. “Nights like Manchester United, AFC Wimbledon and promotion here are some of the most amazing times I’ve had on that touchline. It’s now another chapter. Robinson admitted his side rode their luck, with two dubiously awarded penalties putting the result beyond doubt against the League 2 side. With the carrot of Chelsea on offer, Dons showed no signs of a repeat performance from the original tie at Sixfields 10 days ago, restricting Northampton to crosses and tame shots from range as they put Cobblers to the sword. “We rode our luck,” admitted Robinson afterwards. “The first one isn’t a penalty, it’s outside the box, and the second one is a wonderful save by the goalkeeper. We have to be honest, and we got the luck.